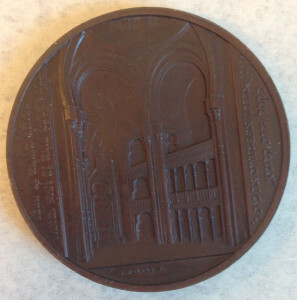 In addition to the many paper-based materials in the William A. Rosenthall Judaica Collection, we have also processed a series of three-dimensional objects. 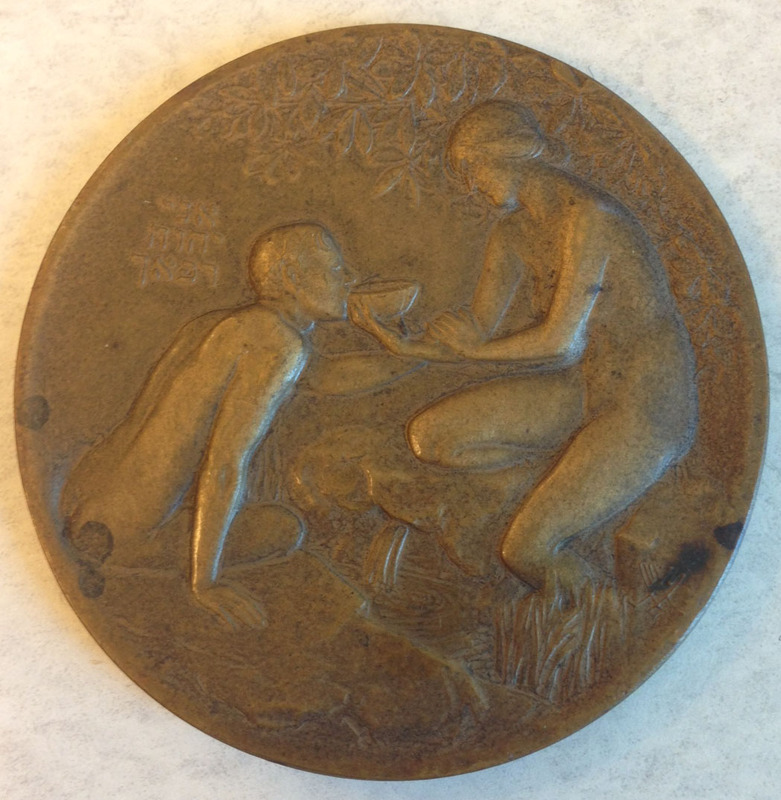 This series of artifacts is comprised of medals and coins, textiles, and commemorative plates. 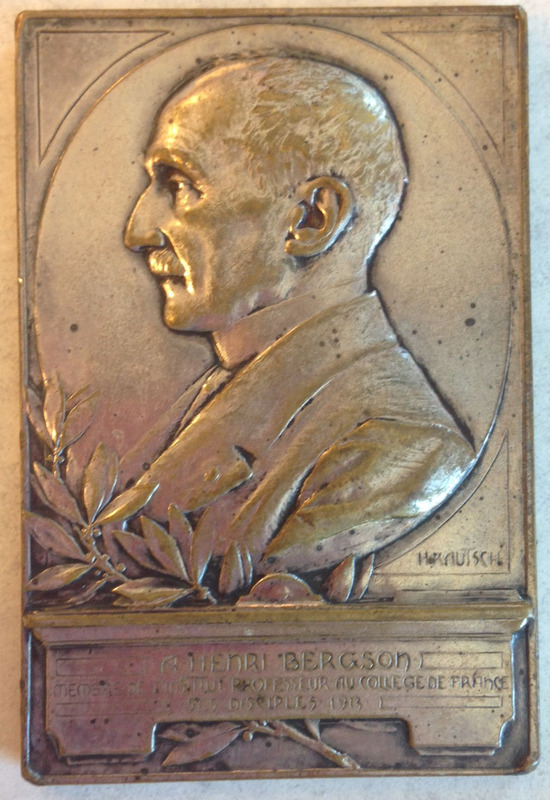 The subjects covered in this series mirror those found throughout the collection, including Antisemitism and persecution, Jewish holidays, Jewish institutions, prominent Jewish figures, the State of Israel, and synagogues. 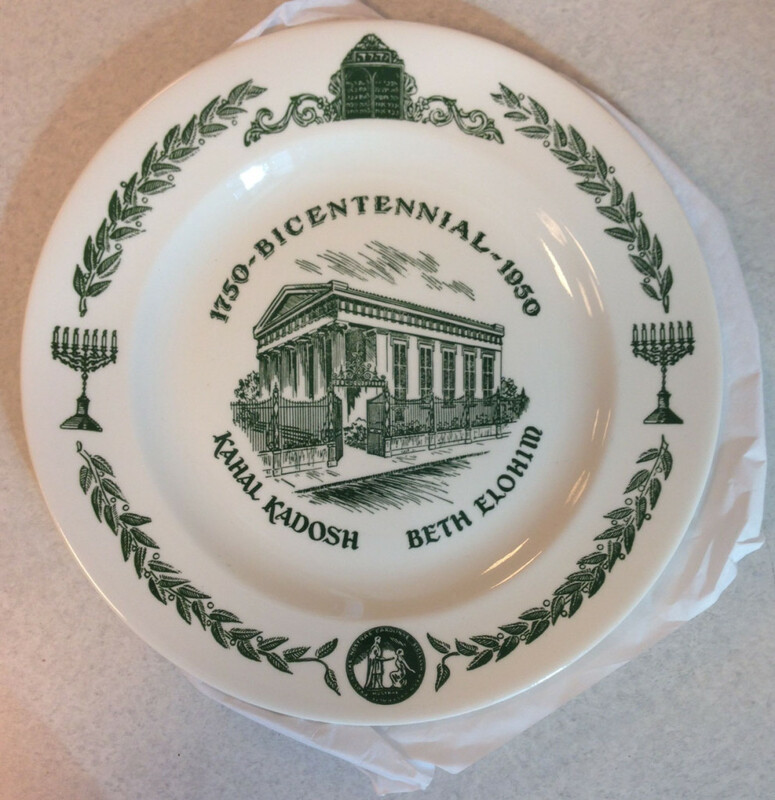 The collection contains three decorative plates, one featuring Benjamin Disraeli and two featuring Kahal Kadosh Beth Elohim in Charleston, South Carolina. 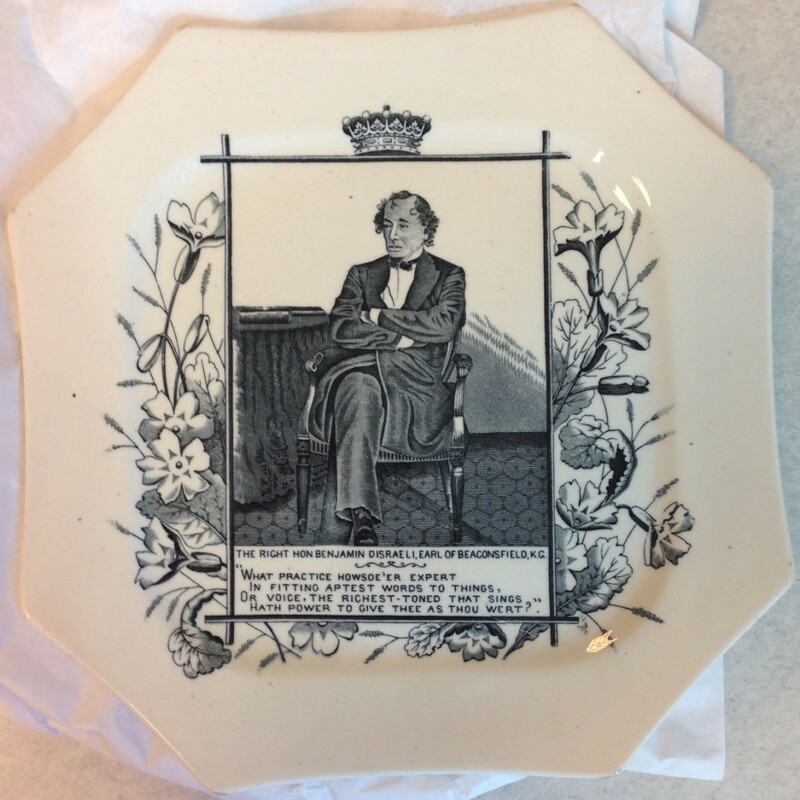 The plate featuring Benjamin Disraeli includes his seated portrait framed by a floral border of primroses, Disraeli’s favorite flower, and his earl’s coronet over the portrait, with an excerpt from Alfred Tennyson’s poem “In Memoriam A.H.H.” at the bottom. This English creamware plate was produced circa 1886 by the Wallis Gimson & Company’s Lane Delph Pottery in Staffordshire. 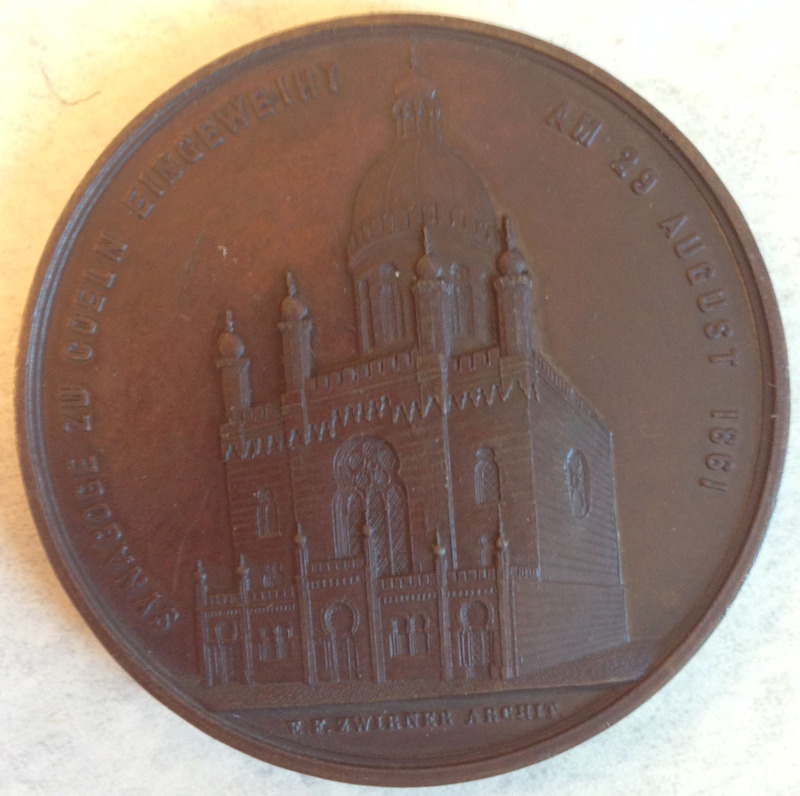 The plate probably commemorates Disraeli’s elevation to the House of Lords in 1876, when Queen Victoria made him the Earl of Beaconsfield. 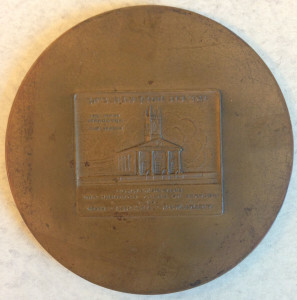 The second plate, pictured at right, commemorates Kahal Kadosh Beth Elohim’s bicentennial in 1950 and features an illustration of the synagogue, with a short printed passage on the history of the Jewish community in Charleston and the synagogue on the back. 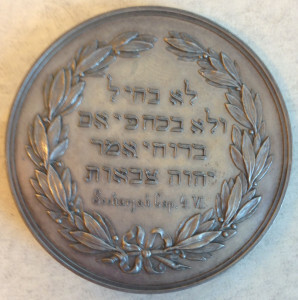 An additional decorative plate held in the collection features a photographic image of Kahal Kadosh Beth Elohim, with a typed note providing a short history of the synagogue taped to the back. 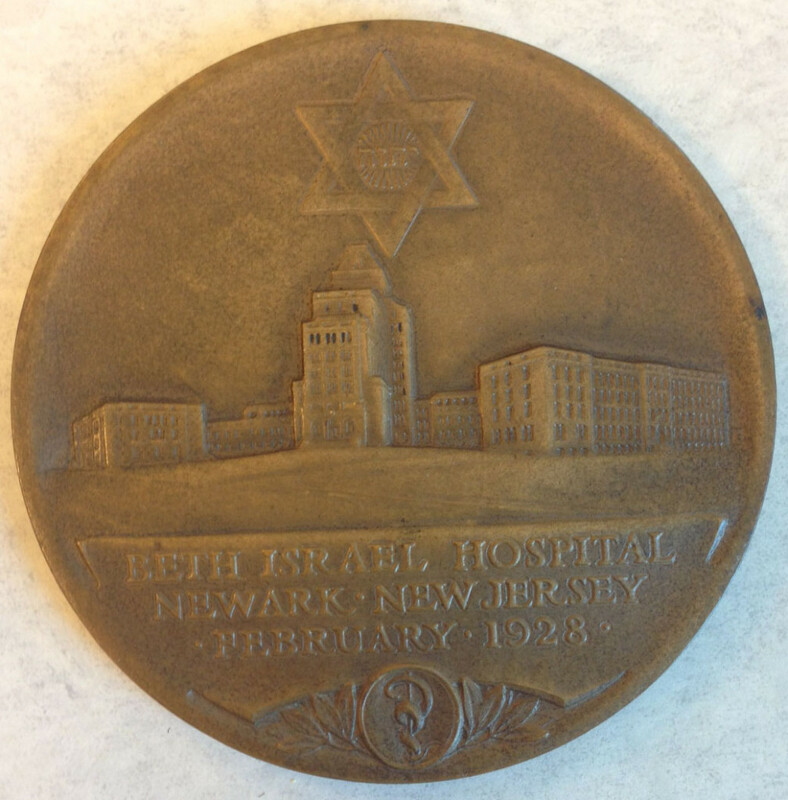 The Rosenthall Collection also includes a small number of textiles, especially those used during the celebration of Passover, such as afikomen bags and matzo covers. 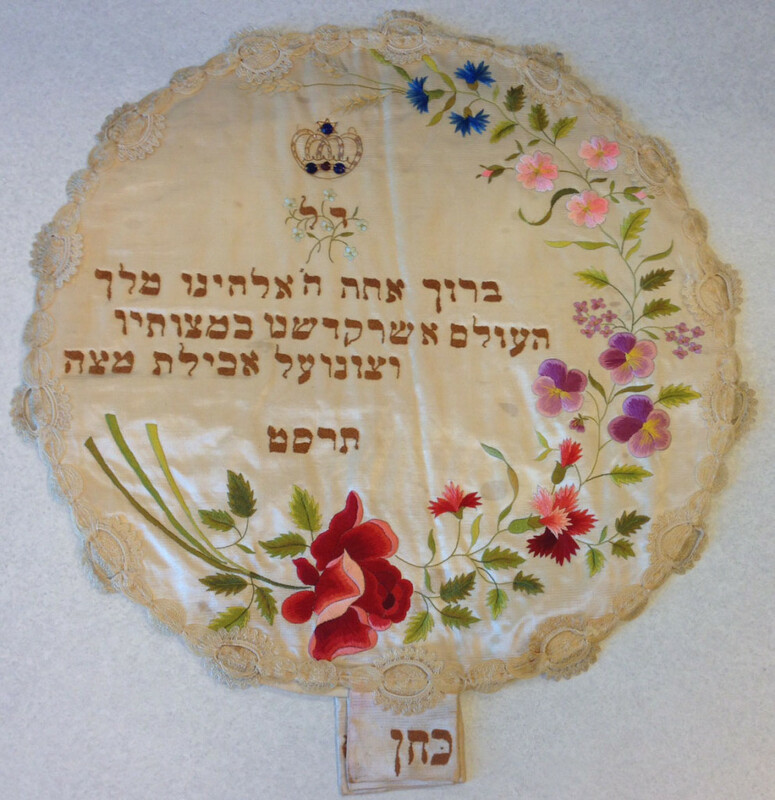 This matzo cover includes the Hebrew blessing over matzo, which translates as : “Blessed are you, Lord our God, King of the universe, who has sanctified us with His commandments, and commanded us to eat matzo.” Both the blessing and the vibrant flowers on the matzo cover are embroidered; lace encircles the cover. 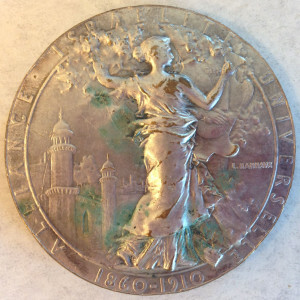 The Hebrew date 5669 at the bottom corresponds to the year 1909. 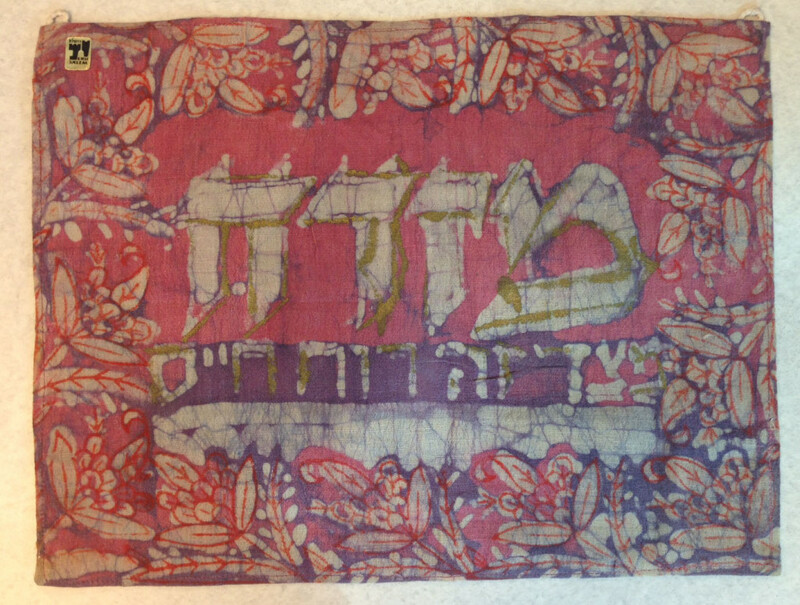 Additional textiles in the collection include a textile featuring an image of Bnei Brak, Israel, a wall tapestry including a border of the Hebrew text of Exodus 23:25-26, and this Mizrah, which would be hung on the eastern wall in Jewish homes or synagogues to indicate the direction to face in prayer. 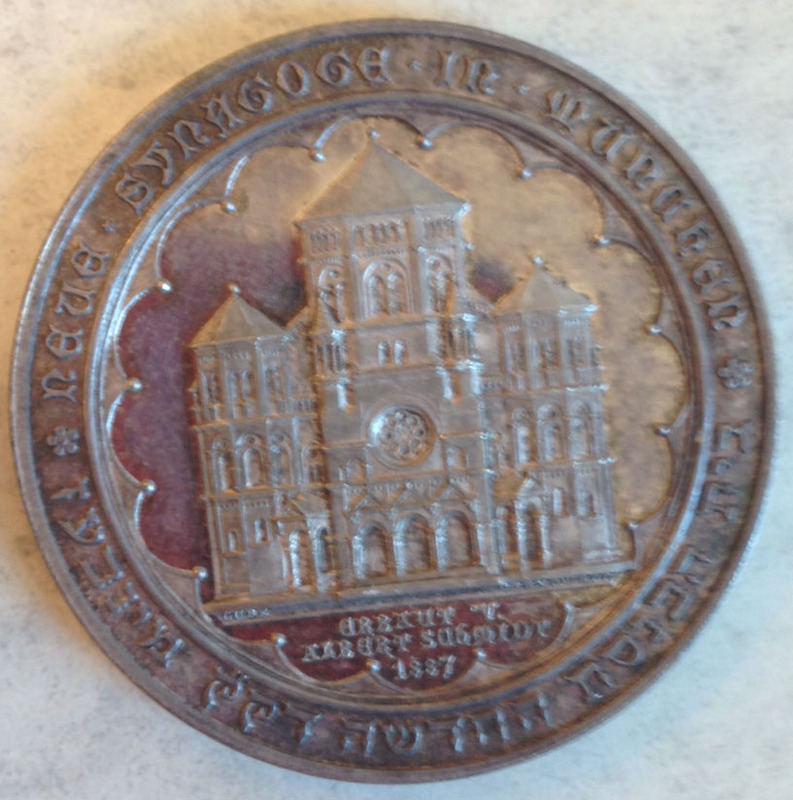 The most substantial portion of this series is Rabbi Rosenthall’s collection of medals and coins, which has particular strengths in the subjects of prominent Jewish figures, Jewish institutions, and synagogues. 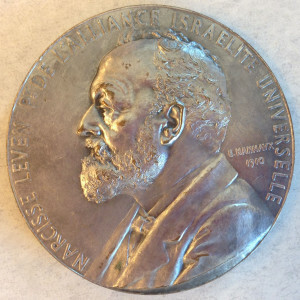 The medals of prominent Jewish figures feature artists and authors, bankers and businessmen, military leaders, philanthropists, philosophers, politicians, rabbis, and Zionists, among others. 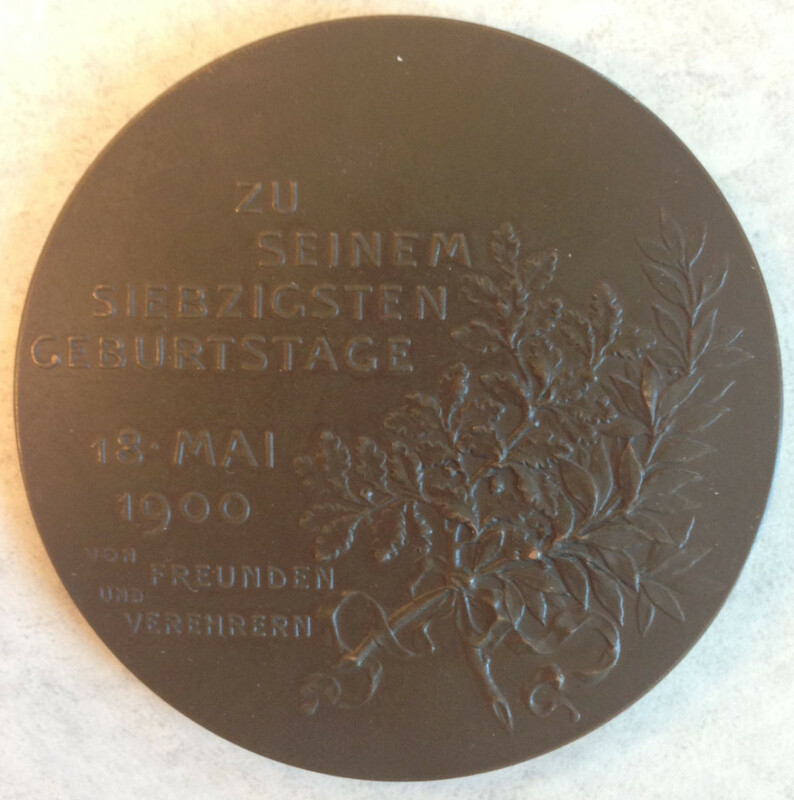 Many of these medals honor the births of these important figures, such as the medals pictured below celebrating the 75th birthday of author Mendele Mocher Sforim and 70th birthday of composer Karl Goldmark. 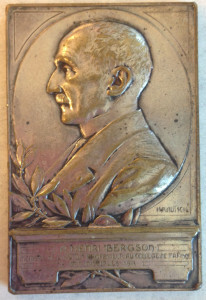 Other medals in this group display not only prominent Jewish individuals, but the organization or institution with which they were most associated. The first medal displayed below commemorates the 50th anniversary of the Alliance israélite universelle in 1910. 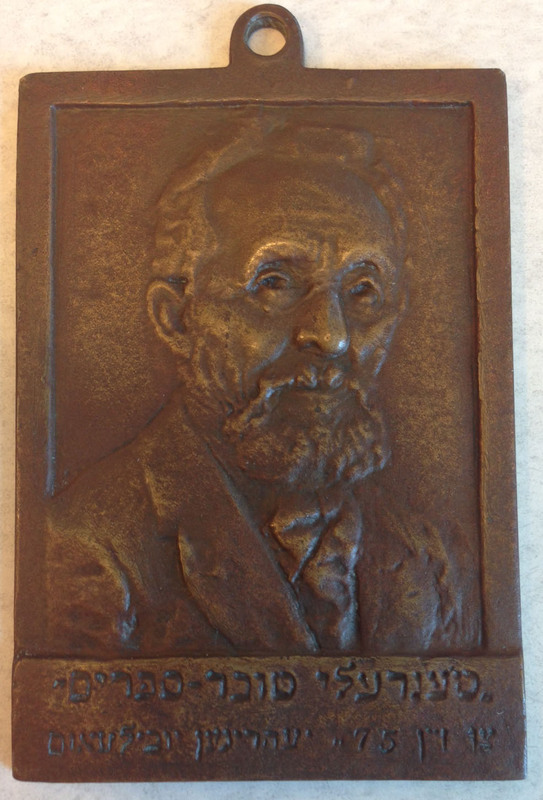 Narcisse Leven, whose bust is shown on the front of the medal, served as general secretary of the organization from 1863 to 1883, its vice-president from 1883 to 1898, and its president beginning in 1898. 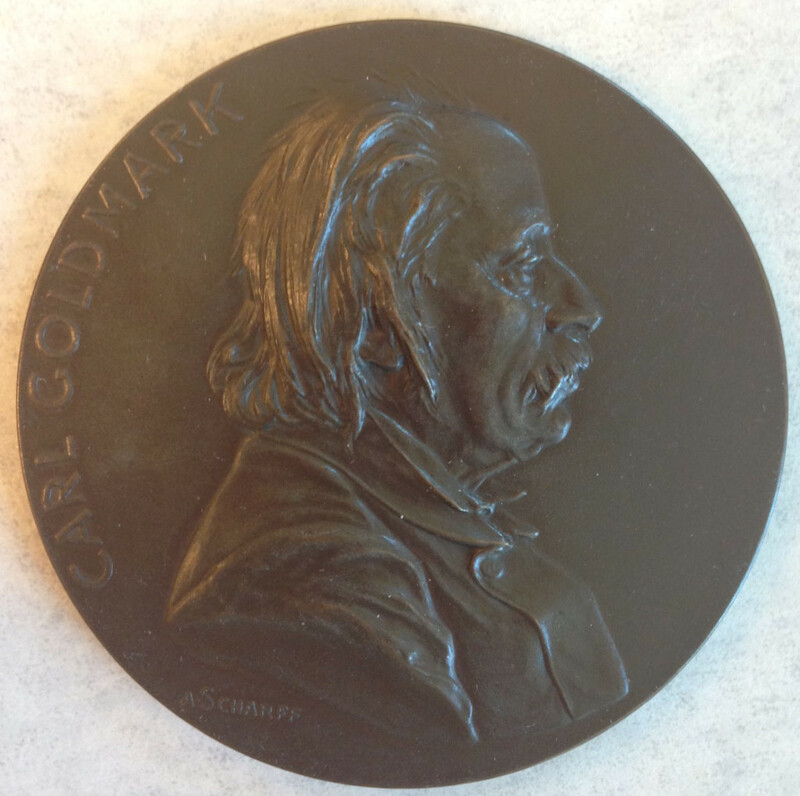 Some medals, such as the medal below featuring actor Adolf von Sonnenthal, commemorate important milestones within the individuals’ lives. This 1881 medal was struck in celebration of Sonnenthal’s 25th anniversary with the K.K. 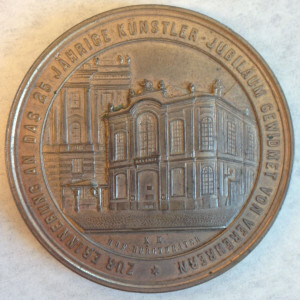 Hofburgtheater (today called the Burgtheater) in Vienna. 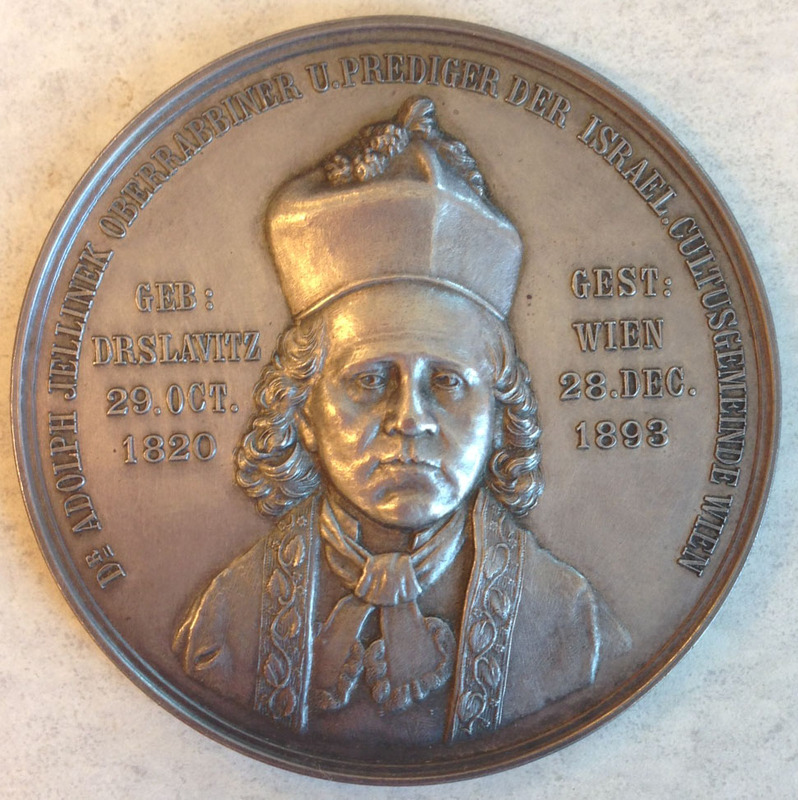 Sonnenthal made his acting debut at the theater in 1856. 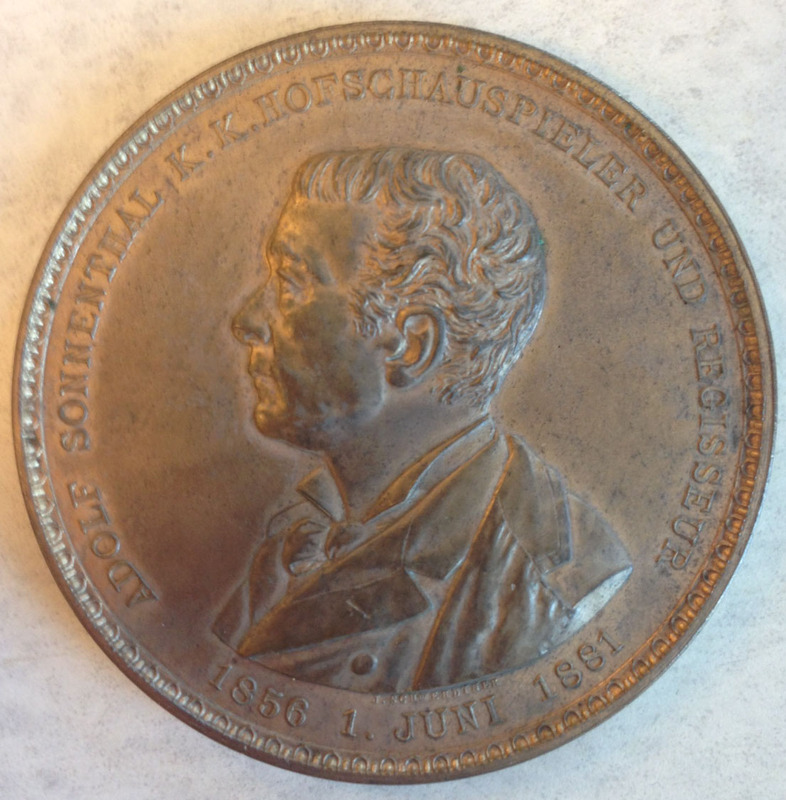 In 1870 Sonnenthal was appointed assistant manager, and in 1884 chief manager, of the Hofburgtheater; and from 1887 to 1888 he acted as its director. His 25th anniversary at this theater was celebrated by all Vienna, and the emperor conferred an order of nobility upon him. 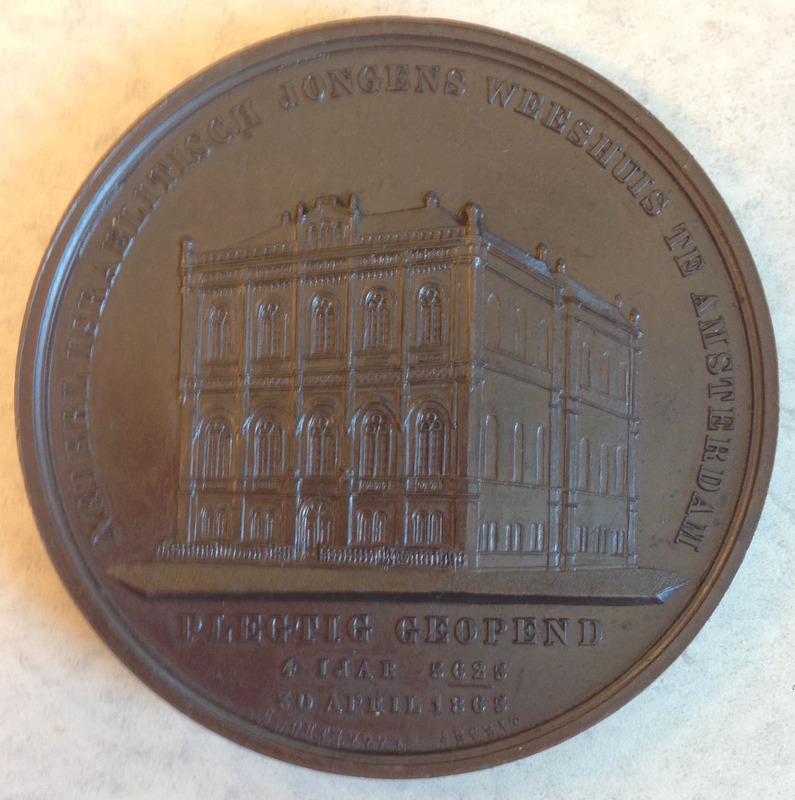 The back of the medal shows the exterior of the theater. 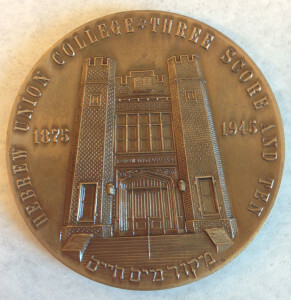 The final medal pictured in this group commemorates the 70th anniversary of the founding of Hebrew Union College (1875-1945). 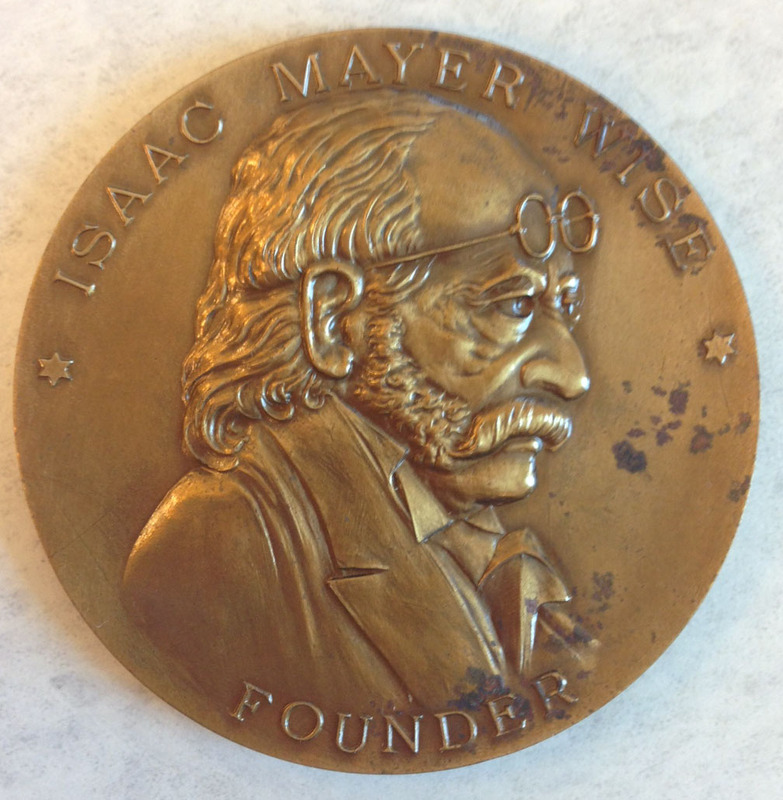 The front depict’s the buildings façade, while the back pictures a bust of the institution’s founder, Rabbi Isaac Mayer Wise. As is the case throughout the collection, the medals subseries is also very strong in items displaying synagogues from Europe, the Middle East, and the United States. 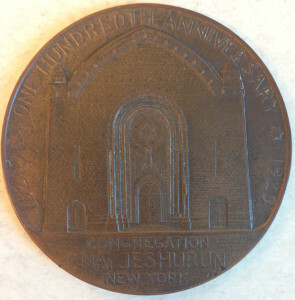 The first medal pictured below commemorates the 100th anniversary of the founding of Congregation B’nai Jeshurun in 1825, the second synagogue in New York City, and the oldest in continuous operation. 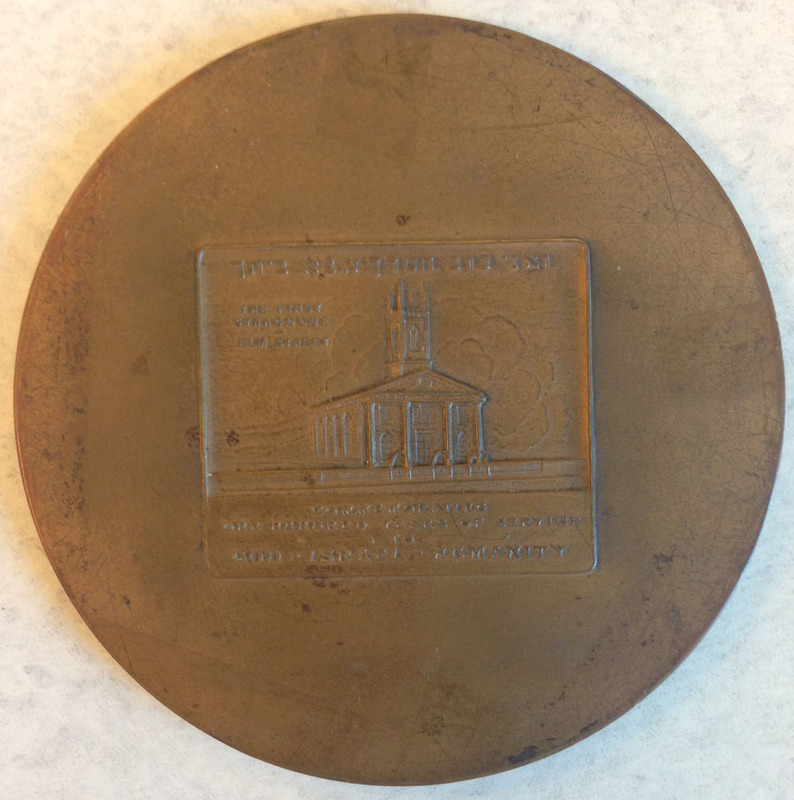 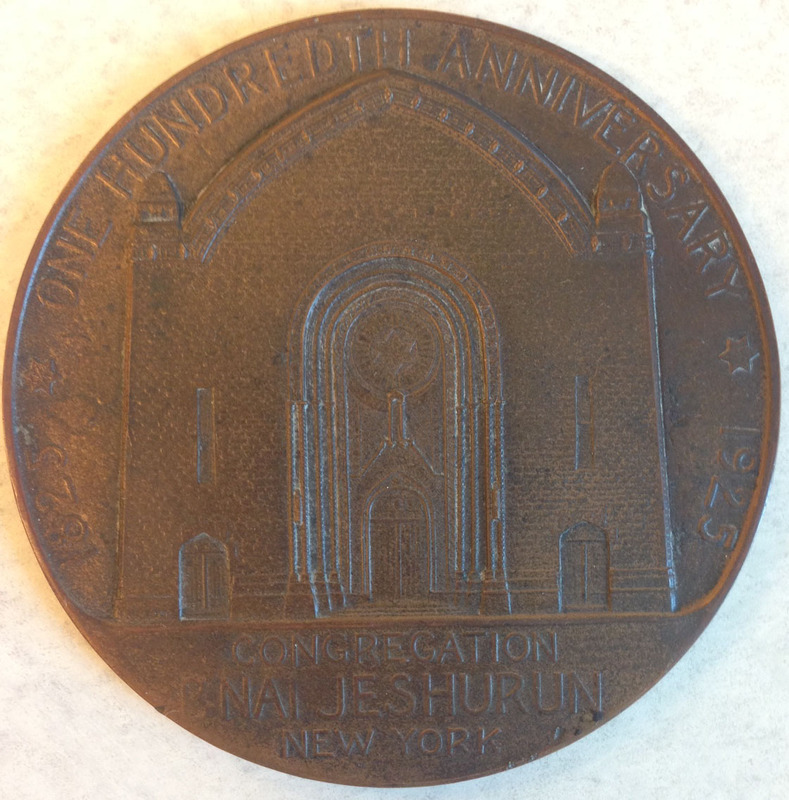 The front of the medal depicts the exterior of the congregation’s current building, which was dedicated in 1917; the reverse depicts the congregation’s first synagogue building on Elm Street in Manhattan. 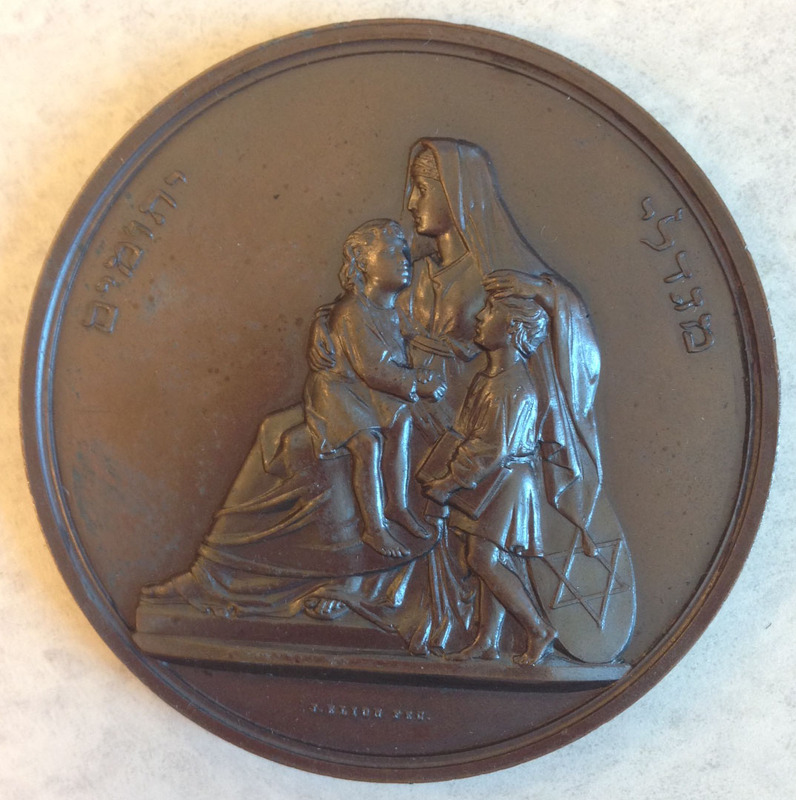 The three following medals commemorate the inaugurations of synagogues in Germany and Italy. 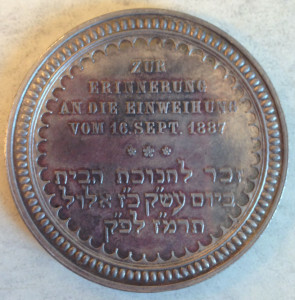 The first medal displayed commemorates the 1887 dedication of the Hauptsynagoge (Main Synagogue) in Munich. 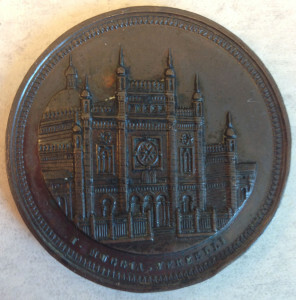 The Rosenthall Collection also contains a 1972 rendition of this medal that displays the same front as the original 1887 medal, but with a reverse displaying a stylized depiction of the Main Synagogue’s remains after its destruction during Kristallnacht (1938). 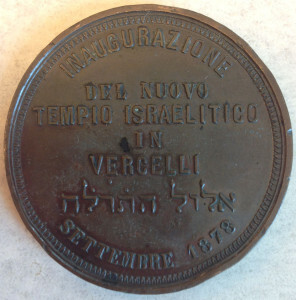 The last medal in this set commemorates the 1878 inauguration of the Tempio Israelitico (synagogue) in Vercelli. 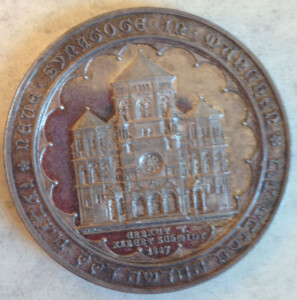 The front of the medal depicts the synagogue’s façade, with the back containing the dedication. 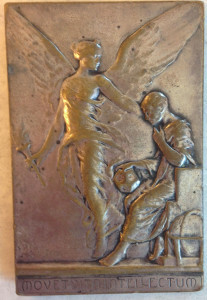 This entry was posted in Processing Update.